We offer group dog training classes for the greater Dayton, Ohio area that include puppy training, socialization classes, obedience classes, and canine enrichment training. Train Your Pup’s Enrichment Center is Dayton Ohio’s original fun and energetic dog training center that focuses on training in an interactive and enriching environment. Whether you have a new puppy or are looking for a new way to bond with your long time companion, we can help you fulfill your goal. Train Your Pup’s Enrichment Center offers: puppy training classes, obedience training classes, and dog/handler enrichment classes. 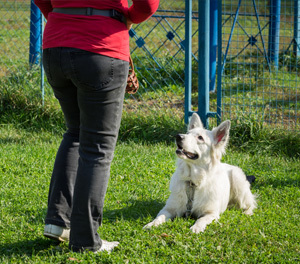 Our dog training philosophy is based on the newest theories of canine and human interaction. We do not subscribe to the “old school” philosophies of alpha, dominance, or pack leadership dog training. Nor are we a 100% positive reinforcement training center. Here at Train Your Pup we believe that life and training are all about balance and treating every dog/handler combination as an individual. Because our techniques are based on positive reinforcement, we do not allow prong or choker collars. We truly believe learning should be fun, so our classes do not just include walking around a circle or repetitious exercises. Each class will have a new game that challenges both dog and handler. These games are intended to keep you and your dogs interested in learning. Unlike many training centers, here at the enrichment centers we keep class sizes small to ensure students receive personal attention and get adequate feedback. Both adult and puppy training classes are held in a clean and professional facility that has been designed to be both inviting and stimulating. Distractions are controlled due to only one class being held at a time. We pride ourselves on not making any owner feel bad about their dogs’ unruly behavior. Just because you may think your dog is unmanageable you should never feel ashamed to bring him or her to class. Train Your Pup also offers at home training for dogs that are not ready for the classroom setting. To ensure each dog and handler get the best out of each class we ask you to contact us to determine which class is best, as well as ensure that our training philosophies are compatible. After you have spoken to one of our trainers, then we will send you a link to sign up for class. Class sign up is done securely through square. Class size is limited to 6 and classes do fill a minimum of 2 weeks before the start date. If you have any issues with your dog or would like to discuss expectations, please do not hesitate to contact us.